All about a little island "monarchy" in Cardigan Bay, which in olden times was one huge cemetery. It is the private property of a member of the aristocracy, but has a crowned King of its own. The travel epidemic has raged so fiercely of late years that it is difficult to imagine there can be an unexplored nook in the whole of Europe, or one spot untraversed by the foot of the ubiquitous tourist. Yet, within the boundaries of Great Britain, there exists a small island-ancient, historic, and of unique interest, though a terra incognita to a large majority. As early as the fifth century this island was a prosperous little kingdom, with a noble abbey and saintly brotherhood, who, according to tradition and existing documents, were granted by God the privilege of dying according to seniority. It was also the Mecca of religious England, and, finally, it became an Island of the Dead. Our little kingdom is a sea-girt rock, to which, for centuries, every barge and shallop brought corpses in place of living emigrants, and every turn of the spade gave evidence of mortality. Today the island is a tiny Arcadic kingdom, where the monarch and his subjects live in true patriarchal simplicity. To them the sea presents fish of many kinds; while the thin soil covering the grave tunneled rocks yields an abundant harvest of unrivalled wheat, barley, and potatoes. The truth of these strange sounding statements may be proved by a journey to Bardsey, an island three leagues from the mainland, at the northern extremity of Cardigan Bay; but the latter part of the journey will not be found easy to accomplish. 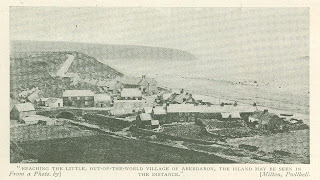 Reaching the little, out-of-the­ world village of Aberdaron, the island may be seen in the distance. On two occasions I reached Aberdaron, but failed to get to the island, for the passage, although only four miles across, is dangerous, and often impossible, by reason of adverse winds and a tide that runs at the rate of seven miles an hour. But I com­forted myself by walking along the shore, where, under my feet, lay the skeletons of many who had failed to reach the sacred isle, and had been reverently buried, their faces towards the wished for goal. The sacredness of Bardsey, by the way, and the difficulties of the journey may be estimated from the old saying: "Twice to Bardsey, once to Rome, or never to Heaven." After many delays we secured a passage in a fishing boat for a sovereign, which is the lowest fare across the sound to Ynys Enlli, or Isle of the Current, as it is termed by the natives. Every moment the boat seemed destined to be sucked under by the hungry current; and as we dodged the flying spray and cowered under our mackintoshes, we wondered if the reason that more dead than living had gone to Bardsey was totally unconnected with the discomfort of the trip. From our port of departure Bardsey looked like a barren rock tapering into a narrow head­land at the southern end. But on near approach the rock develops into a fairly lofty mountain, bristling seaward with overhanging crags, under the shadow of which our smack passed, before reaching a peaceful, sandy creek, sheltered by low rocks and forming a safe harbor for vessels of not more than forty tons. Here we disembarked, with the aid of some of the islanders, headed by their present "monarch," King John Williams the Second, under whose guidance we proceeded to explore the island. Bardsey's present is peculiar, and, in some particulars, unique; but the little island's past is so weird, not to say sensational, that the present is tame by comparison. The whole island is a graveyard, tunneled everywhere into shallow trenches a little more than 2ft. deep, and about the same in width. In these the un-coffined bodies were laid in lines, head to feet, the top of the trenches being covered with rough slabs of stone, over which earth was laid. The King informed us that many of these rude tombs had been laid bare when the foundations of the new farmsteads, built by Lord Newborough, were being dug. "I have seen barrows full of bones taken up," he added; "and we buried them up there," pointing to the old monastery. Strangely enough, all the skeletons found here been those of aged people, which seems to verify the quaint old record of the "dying by seniority." Every day and all day long, in ancient times, processions of monks, bearing the dead, slowly traversed the old high road through Chester, Holywell, St. Asaph, Bangor, and Carnarvon, right on to Aberdaron. Every seven or eight miles were wells or fountains, in the centre of a square composed of stone seats; these were stages or resting places, on reaching which the fatigued and footsore monks, after reverently laying down their burden, rested and bathed their weary feet. Several of these wells are still to be seen. Every monk engaged in this solemn office could demand free lodging and food at any wayside house on the route. As a rule, the usual arrangement was that one set of friars carried the body one stage, and were then relieved by others. Returning, they would probably only have time for refreshment and a brief rest before starting again on the same funereal errand. Relays of funeral processions were daily arriving at Aberdaron, where, if the weather was unpropitious for crossing to Bardsey, the dead were deposited in St. Mary's Chapel, to wait for a fair wind and tide. Often, during the late autumn and winter, communication between the island and the mainland is impossible for weeks together. When this was the case, the bodies were buried in the churchyard by the sea, with their faces towards the sacred isle, and the moaning of the waves as their only requiem. As may be seen today, the little island is a peaceful resting place, guarded by precipitous rocks rising out of the sea. The headlands are covered with gorse and heather, swaying softly to and fro in the westerly breeze; while birds sing of the ecstasy of life, far above those who have done with its joys and sorrows forever. It is scarcely less beautiful when the sea arises in its wrath, and, rolling shoreward in mountainous billows, bursts on the rocks to engulf them in cataracts of foam. Above all whirl the scream­ing seagulls, a grey and sullen sky completing the impressive picture. Our thoughts are brought back to the present when the King of Bardsey draws our attention to a massive Celtic cross of white Anglesea marble, 28ft. high, erected by the Hon. F. G. Wynn, the present Lord of the Isle, in memory of his father, the late Lord New­borough, whose wish it was that twelve months after his death his re­mains should be finally deposited in Bardsey. The island entirely be­longed to him, and he took a deep interest in it. The erection of this monument, which weighs over thirty tons, was only accomplished with great difficulty. The Bardsey of to­day is as unique as it was in the past. It has only seventy-two inhabitants - thirty-­six men and thirty-six females. They are ruled by a "King," who is crowned on his election, and who, like his subjects, earns his bread by the sweat of his brow. The present Ruler succeeded his father, King John Williams the First, who was unfortunately drowned whilst crossing over alone to the mainland. With great difficulty we in­duced his present Majesty to sit for his portrait; it was the first and only one ever taken of him. 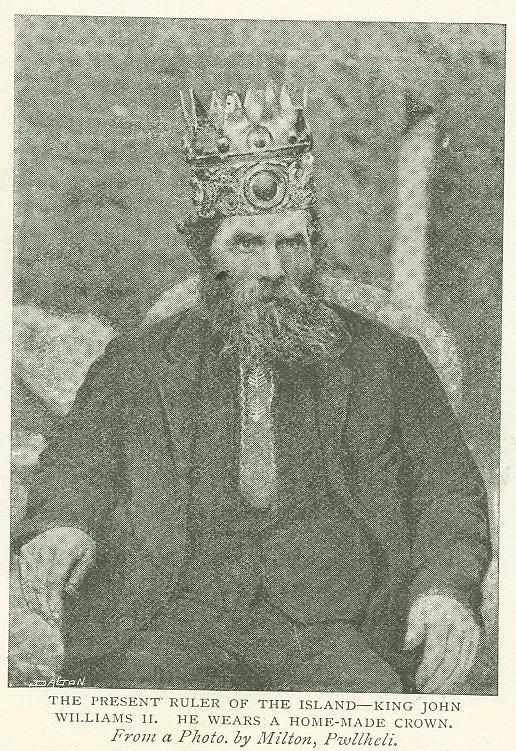 He permitted the crown to be placed on his head for the occasion, but no persuasion - even on the part of his wife - could make him put on his regal Sunday suit. The crown is of home manufacture, and is neither very valuable nor very beautiful, and the King, with a sigh of in­tense relief, as soon as the sitting was over, ex­changed his cumbrous emblem of sovereignty for an old hat. The natives, although a little suspicious of strangers, are, when their confidence is won, very kind and hospitable. A few words of Welsh insure a ready welcome. 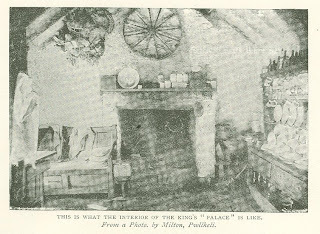 Un­fortunately, the old cot­tages have nearly all been replaced by substantial farmsteads, very comfort­ably arranged, but not half so picturesque or interesting to strangers as the quaint old cottage still standing, of which exterior and interior views are given. The owner was an old widow. Her face, bronzed and wrinkled like a winter apple, was set off by the snowy frills of her cap, which was surmounted by a soft felt hat. Asked why she had discarded the traditional tall hat of her nation, the old dame hastened to assure us they were "old.fashioned now." There is neither public­ house, inn, nor prison on the island; and rates and taxes are unknown. The people lead healthy, peaceful lives, knowing nothing of the outside world, or of poverty, or of riches. There have been only fourteen deaths during the last twenty-five years! Although the island cannot boast of a single tree, the land is very fertile; and the barley and oats of Bardsey always find a ready market, and are better known than the island itself. The sea also yields a plenteous harvest of fish-such as lobsters, crabs, roach, cod, gurnets, and mackerel. Several seals have also been caught; one, a very large one, was recently captured in the Seal Cave, which lies at the southeast of the island. The inhabitants, many years ago (the King informed us), used to make a living by the dangerous work of collecting the eggs of sea-fowl, but this is now forbidden, on account of its danger. We looked up at the rocks, where we were told, the men were let down by chains, in order to reach the crevices and precipices where the eggs were most plentiful, and really one felt glad that such hair-raising exploits are no longer permitted. Among these rocks the tiny sheep of Bardsey browse contentedly, perched on ledges that make them look as if suspended in the air. Dogs are cleverly trained to catch them, but, once on the rocks, they are safe from pursuit, for they will even jump into the sea to avoid capture. The inhabitants own about sixty head of cattle, besides horses, pigs, and poultry. So that altogether their lot (except for the loneli­ness of their lives) is a very enviable one. They pay merely nominal rents. The air they breathe is delightfully invigorating, and water is their only beverage - the best I ever tasted, and as clear as crystal. Curiously enough, until the year 1798 no sparrow had ever been known to breed on the island; three nests were, however, built in that year, and the cheeky little birds have now become quite a colony. A new church has recently been built, and the old one converted into a schoolhouse. The minister is also schoolmaster, most of his pupils being his own children; for he boasts of a larger family than the whole of the islanders put together! On the headland at the south end of the island is a lighthouse 108ft. high, belonging to the Trinity Board. It is provided with a revolving light and a fog-horn. Three light­house keepers and their families live there. Mr. Jenkins, the principal of the lighthouse, was recently killed by falling 120ft. over the precipice. The Hon. F. G. Wynn, the Lord of the Isle, frequently spends several days among the people, shooting and fishing. For our own part we were loath to leave the island, both the place and people being so interesting. 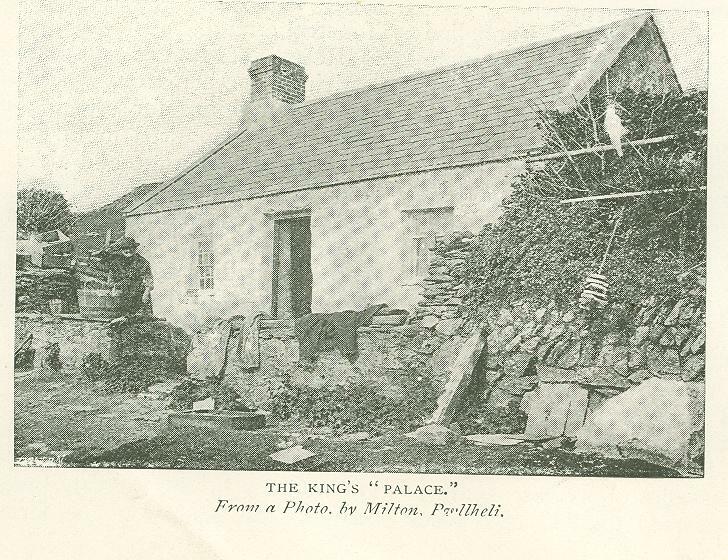 But, being warned of a coming storm, which might keep us prisoners in Bardsey for a week or two, we hurriedly bade our hospitable entertainers farewell; no less a personage than the King offering to row us back!